An original soft pastel painting on linen board by June Pauline Zent 24×30 inches. He looks like he is praying, right? Not so at all he was just waiting for my daughter Holly to open her hand a bit then he would be gone like a deer over a fence. Fred was Holly’s pet. 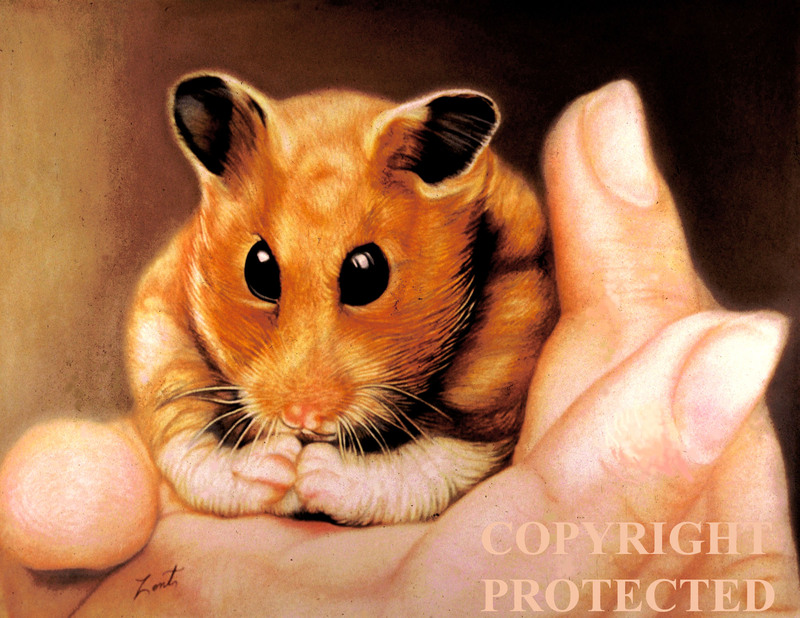 Most kids want a dog or a cat, Not Holly she had control issues: she wanted Fred the hamster because he was little, fuzzy, cute, and she could restrain him in her hand without worry regarding his human flesh biting tendencies. This was a kid that would run screaming like she was on fire if she saw a spider. Her younger sister had to hold her hand and guide her through the dark to the bathroom. Nighttime was just one more thing that she couldn’t get a grip on and control. Addie, the guide and adventurer called her the ultimately feminine sister. Unlike most kids Holly took her charge seriously and would come home from school every day to clean the cage and give Fred food and water. She talked to him like a baby and sat watching him for hours sometimes taking him out of the cage and carrying him about the house. Fred sniffed the air, wriggled his nose and tolerated this jail time. Being off his wheel was not within his comfort zone. He did escape Holly’s grip occasionally and would run under, over, around,and inside of everything . A olympian would have been proud to have those legs which had spent hours and hours running endlessly on his wheel. He was as slippery a brown eel too. You thought you had him and shoot! ; there he goes again under the couch. He was a personality to contend with and contributed many laughs not to mention exercise for the whole family. Notice that I have used the past tense here. Yes, Fred is dead. Holly woke up one morning and there he was stiff as a brown whisk broom, feet in the air , and glassy-eyed. She cried and cried then we gave him a proper funeral and burial in the front yard. I offered to buy her another hamster but she said there would never be a hamster like Fred. So gathering my pictures of Holly and Fred I composed the painting above. There is nothing like art to keep a memory alive and remind us of the important events in life. Holly is a grown woman now, She is a Certified Public Accountant with many achievements to her name. But she still comes out to my house in the woods holding something over her head so that the evil spiders wont get her! This entry was posted in Original artwork by June Pauline Zent, True Stories About Artwork, Uncategorized, Wild and tame animal stories and tagged art, artist, cages human intrest, family, love, pets, soft pastel. Bookmark the permalink. Fred reminded me of Ngoo-Ngoo, my pet rabbit, who was my companion for two days and one night. Oh, Manu how sweet. I am glad that it gave you happy memories! Thank you stefan, I am glad that you like it! Thanks for the compliment! Thank you so much for coming here and taking the time to compliment the post. It means a lot from you! Yes, My granddaughter Lily has one as well. Guess it runs in the family! Thank you Sharon !. Always great to see you here and I value your comments very much! [ Smiles ] Fred, the hamster, is rather adorable. Yes, he was a cutie pie and well worth painting. He gave a lot to our family. I will add you to the others that I must give a special thanks your gift! I am blown away and honored by your reblog and it is so well written. Your Hammy’s are the cutest and I know how much you love them. They are awesome entertaining pets and become part of your family.. Go here to see them http://hamsterdiaries.wordpress.com/ This blogger is awesome! So glad that you think so ! Thank you. Thank you Livesinstone for the great comments and compliments. Yes, Fred was a cutie pie and was fun to paint! That was a lovely story and it was so nice of you to paint a picture, so Fred could be forever remembered. Its amazing how these little critters can endear themselves into a child’s life. Very glad that you liked the story Maggie. I think that i have painted pictures of all my kids pets and they sure do appreciate them. Those childhood memories are very important. What a nice tribute for a beloved pet! I’m sure Holly really appreciated Fred’s portrait. I know I would have if it had been me. Thank you Jessica. Yes she does enjoy a Limited Edition print. the original was sold many years ago. Now I never sale paintings with family or family pets. thank you for coming here and comenting. always welcome! Oh, LB thank you so much for coming here and leaving that sweet comment. Your support is important to me! Thank you for coming here and complimenting Fred. He Certainly was a cutie. I think that having a pet that you can hold is important as a child and hamsters are great with kids. A very nice story. My daughter first pet was a hamster. Small and easy to take of. Thank you for sharing the story. I appreciate you stopping by and reading my story and poetry. The pleasure is all mine John! I love your blog. Yes, a good first pet is a hamster; hours of fun and not much work. Thanks for you great comment! Thank you so much for your great comments and for your visits to my post. I will certainly check you blog out and will look forward to reading great post from you!